Bonham, Texas (33°35′2″N 96°10′54″W) is the county seat of Fannin County and is named for James Butler Bonham (1807-1836), one of the defenders who died at the Alamo. He was born to James and Sophia Butler Bonham in 1807 in Red Banks, South Carolina. Bonham was raised in South Carolina and attended but did not graduate from South Carolina College. He then studied law and began a law practice in South Carolina in 1830 where he would remain until about 1834 when he moved west to Montgomery, Alabama, where the family had relatives. It was in Alabama where his ties to Texas were apparently made. In response to the treatment of the Texas residents by Mexico, he was involved in organizing the Mobile (Alabama) Greys to serve in the Texas Revolution. Members of the Greys fought all the way to the Battle of San Jacinto. Bonham apparently first arrived in Texas in late 1835 and on December 1, 1835, he wrote to Sam Houston volunteering his services in the Texas Army. He established his law practice in Brazoria and received a commission of 2nd Lieutenant in the Texas Cavalry by the end of December. It is believed that Bonham served in and around the Alamo for about two months before the March 1836 siege by Santa Anna began and that he died commanding a cannon emplacement in the chapel of the Alamo, the last day of the battle. Some accounts list him with a higher rank, but it is believed that at the time of his death, he was still a 2nd Lieutenant. The town of Bohnam was founded the following year. It was first named Bois D’Arc and in 1843 was assigned the name Bloomington by the Congress of the Republic of Texas. However, by the time the town was incorporated in 1848, it had been renamed to honor James Bonham. 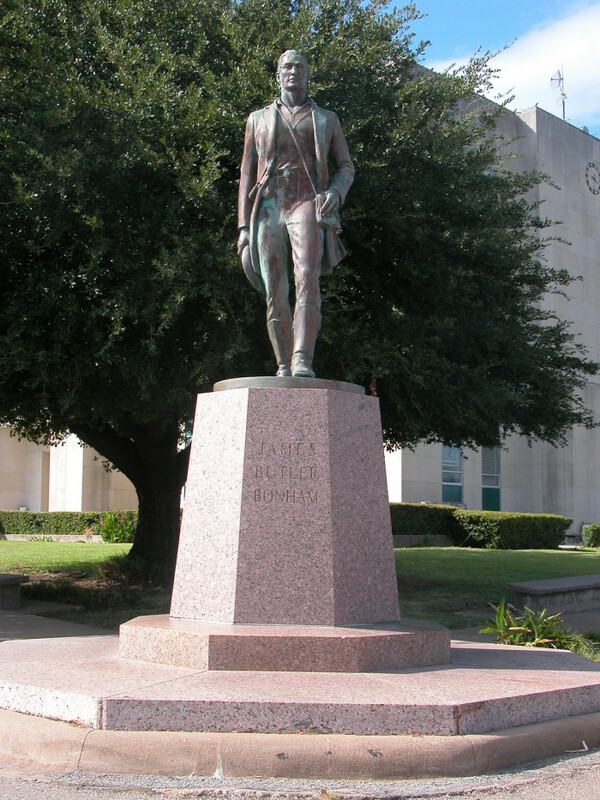 The statue of James Bonham pictured below was erected on the courthouse square in Bonham to coincide with the Texas Centennial in 1936. In addition to the town having been named for him, numerous schools across the state also bear his name. Notable individuals from Bonham, Texas include Sen. Sam Rayburn, outlaw John Wesley Hardin, a number of Major League Baseball players including Joe Morgan, Tom McBride, Roy McMillan, Danny Darwin (“the Bonham Bullet”) and Homer Blankenship.